I entered the world of Forza Motorsport largely by chance. I knew that my first Xbox One game would have to be appropriate for my young cousins, as they would be at my house when the console arrived, so my already small list of options became even more limited. Wanting a game that would show off what the system can do, I opted for Forza Motorsport 5. In the past I’d always preferred arcade style racing games, so I wasn’t positive that this was the right choice. But once I started, I didn’t stop playing the game regularly until about a year later. Needless to say, I was excited for the sequel. Forza 5 was an excellent game that suffered only from a lack of content, so I really hoped that Forza 6 would add enough to make it worth upgrading. But before we get to additions, it’s important to note that all of the best things about Forza 5 are still here, starting with the commitment to realism. Every car feels like it should; each has different weight, power, and aerodynamics, and you can always tell. Racing cars feel fast and nimble, super cars feel powerful and dynamic, and the 1960s Volkswagen bus feels slow and lumbering. It’s always very clear how much traction you have, because Forza is among the very few games that use the Xbox One’s rumble triggers. And most impressively, every car and track is modeled with meticulous attention to detail. From the signature on the Mercedes-Benz SLR’s engine to the scuff marks on the road, it’s clear that developer Turn 10 left no stone unturned. While the graphics haven’t been upgraded too much from last time, Forza 6 still runs at 1080p and 60 frames per second, and it really shows. The frame rate in particular is apparent with just how smoothly everything runs. They have also managed to improve the anti-aliasing this time, so you aren’t assaulted with jagged lines nearly as often. The last game had some amazing graphics to begin with, so I can’t ask for much more than that. There is a lot more added to this entry than just some minor graphical improvements, though. 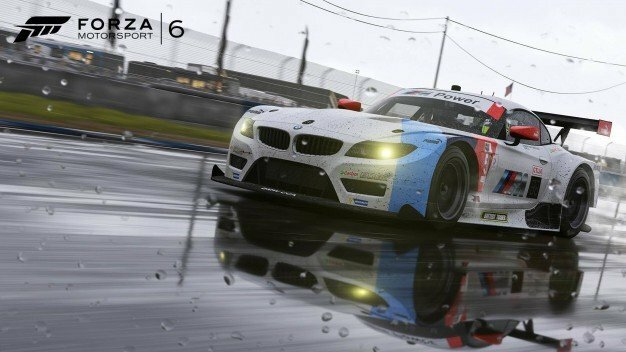 With Forza 6, Turn 10 addressed just about every complaint and suggestion players gave them about Forza 5. The biggest additions are the inclusions of rain and night time racing. Naturally, these aren’t just for visuals. You’ll need to reconsider how you drive in the rain; not only will the road be more slick in general, making steering more difficult, you’ll also have to deal with puddles forming on the track. As in real life, puddles will seriously mess up your traction, so you’ll often want to plot a course around them. Even racing at night affects your driving, as the tires cool down, it gets harder for them to grip the asphalt. You probably don’t notice it when you’re driving the family car, but the difference is clear when racing. Note that night and rain racing are only available for a fairly small group of tracks, and these features are not dynamic. According to Turn 10, this is so players can practice driving in the same conditions that they’ll see during the race, which seems sensible. They also aren’t available on every track, as Turn 10 wanted to limit them to appropriate locations. The nice thing about this is that the rain has an appropriate effect on each track. Apparently, Turn 10 actually monitored where puddles tend to form, so even that part is realistic. These two features were among the most highly requested in Forza 5, and I’m glad they’re finally present, as they add significant variety to the gameplay. 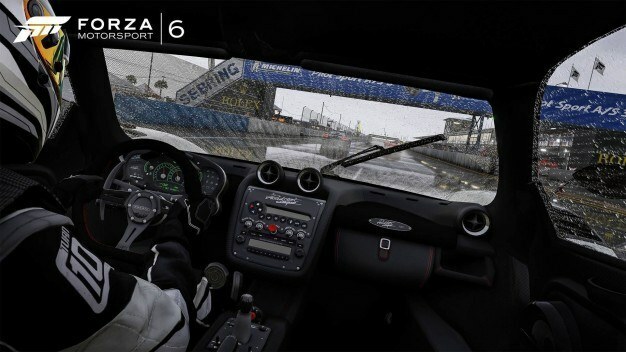 And speaking of adding, Forza 6 has a lot more under the hood than its predecessor. 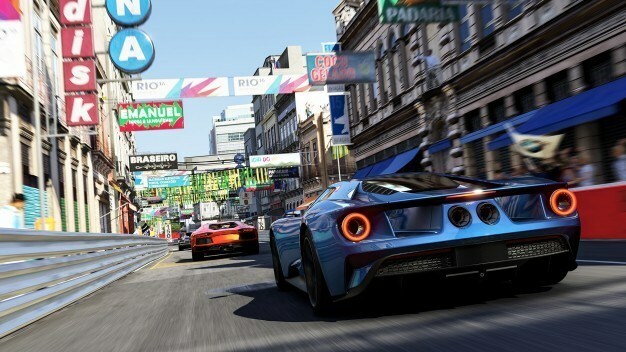 There are over 450 cars available on the disc, compared to just 200 in Forza 5. It’s also much easier to get your hands on them, as Forza 6 is also much more generous with cars and credits. Not only is the overall economy better, the spin mechanic from Forza Horizon 2 is now present in the main series. Every time your driver level increases, you get a chance on a Press Your Luck – style board. You can win new cars or credits, which makes it easier to grow your collection. There is also a new type of collectible called Mods, which come in random packs of various costs. Mods might improve your car’s traction, increase your credits or experience after a race, or let you take on a challenge to make races more difficult (with a higher reward). It is a shame that you have to decide between buying cars or buying mods, but I won’t say no to extra options for customization. 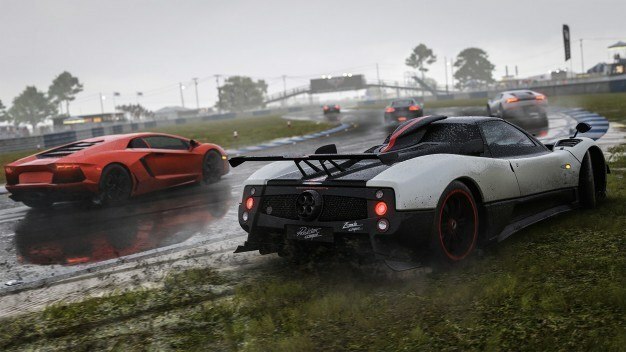 Returning Forza fans will even enter the game with some top notch rides, as the game immediately rewards players for each tier they’ve reached in Forza Rewards, each previous Forza game they’ve played (starting with Forza Motorsport 4), and each previous game for which they’ve had a VIP membership. You even get the cover car just for playing the demo, and you’ll get even more if you preordered the game and/or go for one of the premium versions. All things considered, Forza Motorsport 6 is the best simulation game out there. This doesn’t mean it’s perfect, though; while the core of the game is excellent, there are some some issues with how you access races. The biggest example of this is Forza 6‘s main career mode, Stories of Motorsport. 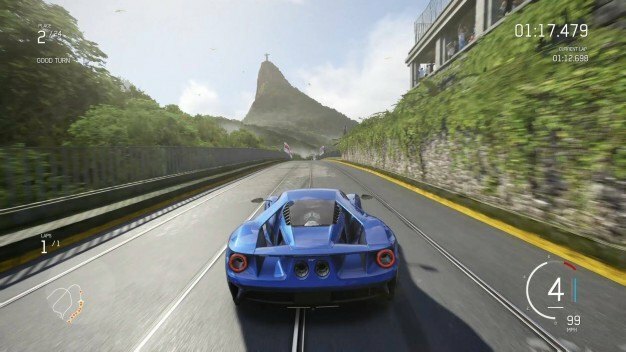 While Forza 5 let you choose whichever racing series you wanted (as long as you had a compatible car), the sequel is much more linear. You can choose between car categories within the five sections of the career, but ultimately it comes down to this: you’re going to be stuck with cheap, low powered cars for the first fifth of the career mode. Fortunately, this is somewhat alleviated by the second career mode, which features a variety of races in a number of interesting categories. The first of these are unlocked pretty quickly after you start Stories of Motorsport, and they invite much more variety, but there’s a catch: you aren’t using your own cars. That means you can use some of the best vehicles in the game before you can afford them, but none of your customizations will be present, and you can’t choose whichever car you want. It could be a lot worse, but I’d still prefer for the main career mode to be more open. The other issue is the menus, which have the same problems we saw in the last game. It seems like everything takes far more clicks than it should. For example, say you’re looking for a community created design for one of your cars. You find one that looks interesting, but you can’t be sure because of the single camera angle used to illustrate it. In order to get a 360 degree view of the car, you need to download the design, exit the design options, and enter Forza Vista mode (there are other methods, but this is the best). If you don’t like it, you have to start your design search from scratch. Beyond that, options appear in places you wouldn’t really expect, such as your library of downloaded designs being found in a different section from where you find new ones. It can be very counter-intuitive. These are minor gripes, though, and they don’t hurt the overall gameplay. The graphics and core mechanics are top notch, impressive even in detail. Yes, another game on a top of the line PC could probably beat the graphics, but that’s not the experience most of us will have. 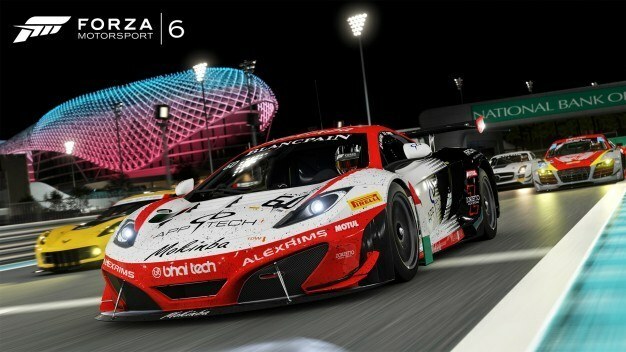 With its excellent core and wide variety, Forza 6 is ultimately the best racing game available. If you are a fan of racing, or even just cars, nothing else will scratch the itch like this. Even a less than ideal career mode shouldn’t deter you; at the end of the day, it’s really about the racing, and it’s hard to beat what Forza 6 brings. So don’t be afraid to take the plunge; there are still Assists present to help those less comfortable with simulation games, and they don’t take away from the racing at all. Give it a try, and I bet you’ll get as hooked as I did.